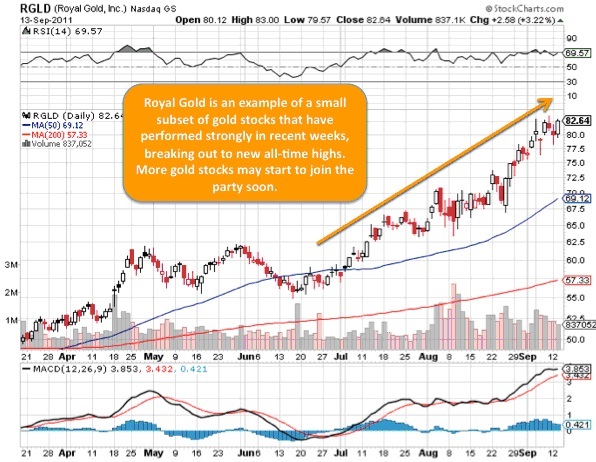 Are Gold Mining Stocks Getting Ready To Run? I asked my good friend Dave Blais, who trades gold and silver stocks full time, to provide an update on what he sees happening in the gold market, in follow up to the last piece he penned for OGIB readers several weeks ago. The frustrating under-performance of the precious metals shares – in particular the gold mining shares – may be finally ending. In fact, the stock charts are telling me the gold shares are now basing for what could be a large move up. Certainly for the past year or more, owning stagnant gold mining shares has been a disappointment for many investors as they watched the price of gold bullion soar. In recent months especially, the gold shares as a group have simply not played their traditional role as a leveraged play on the metals themselves. 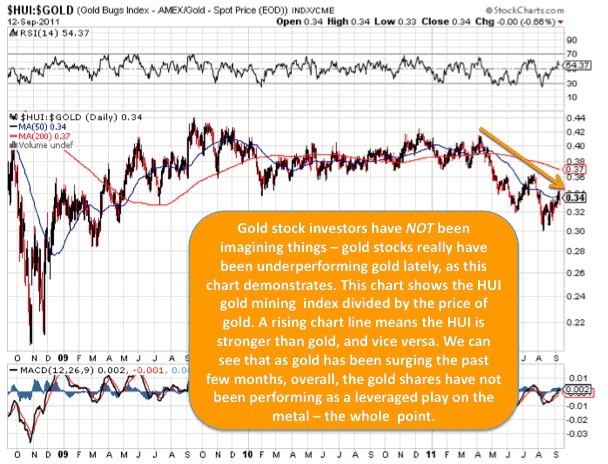 On the contrary, until very recently many gold mining shares have been acting weak, while gold itself bolted upward. Only a small subset of the gold shares performed reasonably well by mirroring – or in some cases somewhat bettering – the action in the metal. This means successful investors have had to be very selective in which gold mining stocks they owned in 2011. 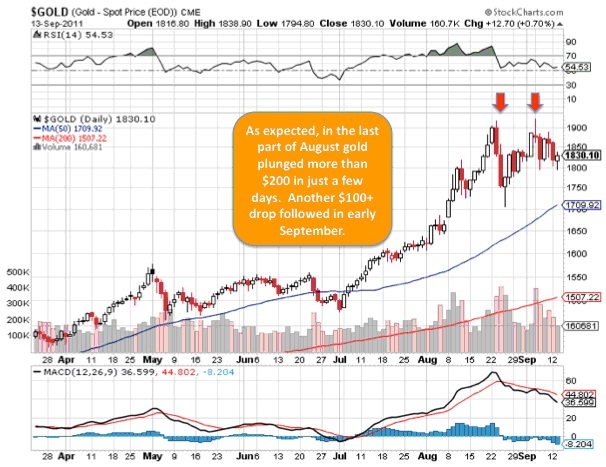 Things may be about the change – the gold shares may be shaking off their lethargy, getting ready to make a big move. A rising tide may be starting that will lift all – or at least most – boats. I think the tide is coming in. What’s more, the base for this potentially big rise may be forming — right now. If so, sometime in the next few weeks, the gold shares may begin a profound rise. This scenario fits my theory where I had been looking for a temporary top in gold to happen on either side of Labour Day. As I explained in my last article – this has been the historical tendency when gold has had an outsized summer run like we just got. As expected, we did get strong corrective action in gold – shortly before Labour Day gold dropped more than $200 in a few days. And then for good measure, gold rebounded, made a new temporary high and gold corrected strongly again shortly after Labour Day, diving more than $100. However, when gold had these most recent corrections on either side of Labour Day, we saw something different happen with the gold shares that we have not seen in a very long while –when gold corrected, the gold shares were consistently stronger than the metal. Even more surprising, when gold had its more than $100 dollar drop just after Labour Day, the shares actually rose. 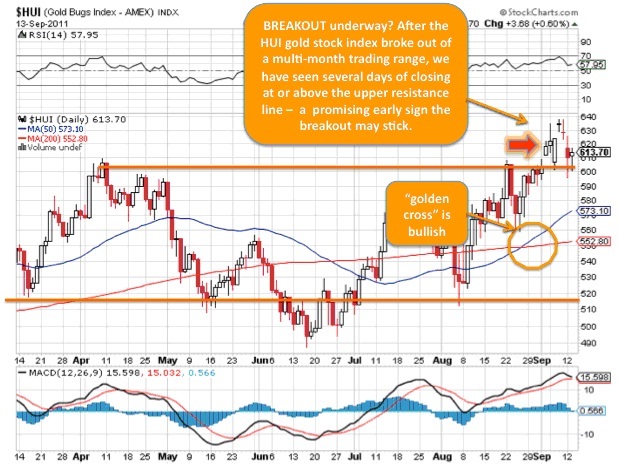 And then in the last several days, the HUI, an index made up mostly of unhedged gold miners, did something remarkable – it broke out of a multi-month consolidation while gold was well below its recent highs, a very bullish sign. Based on the very recent potential breakout action in the HUI, I scaled in modestly to some of the most promising precious metals shares I am tracking. I will scale in more if the HUI can hold above the breakout over the next few days and weeks. We may be at a very exciting juncture that bears close watching. A few weeks does not necessarily make a trend, but make no mistake – the very recent gold stock stock action is very impressive. If this breakout in the gold stocks holds and builds strength over the next several days and weeks, we very well may have a major breakout on our hands, portending significant gains ahead.